First Real View Of Black-backed Woodpeckers! 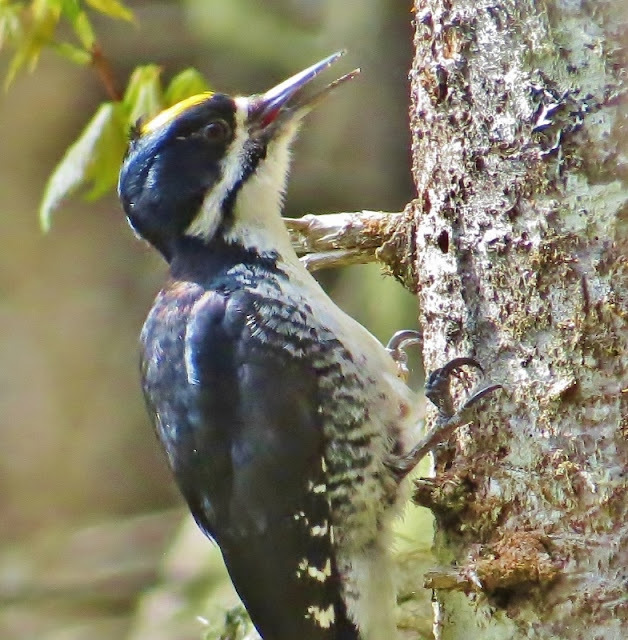 The Black-backed Woodpecker has been a bird that I've wanted to see for several years. 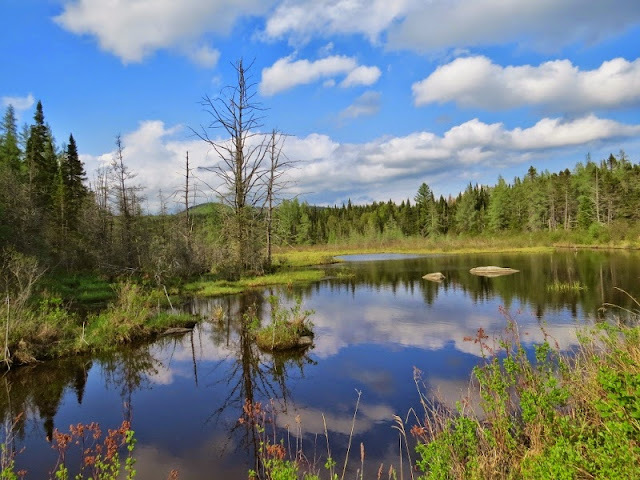 They are found in certain areas of northern new England where there is boreal habitat. They peel off bark looking in search of wood-boring beetles in specific spruce stands where some of the trees are in the process of dying after a fire, blow-down etc. I've been to the areas where they exist during fishing trips over the years but I always came up empty handed when I searched for one. The Black-backed Woodpecker became my "bogey-bird" and after numerous misses it started to feel more like a search for Bigfoot. This year, I decided to put an end to the losing streak. I used ebird to look for locations with the most recent report of Black-backed Woodpeckers. I went camping where they were reported and then contacted Tom who is the board president of the Northeast kingdom Audubon . Tom kindly agreed to meet up with me to help me my search for them. He knew the best places to look for them and showed me where there was a nest sight. We waited patiently watching from a distance but only had a brief view of the male sticking his head out of the nest-hole cavity. We moved to a different patch of woods where the sound of a Yellow-bellied Flycatcher caught our attention. We hiked deeper into the woods to try to find the flycatcher and it was then that we heard the unique pik note of A Black-backed Woodpecker. We found a male (above) and a female busy moving from tree to tree in search of food. It was quite a thrill to finally find them and be able to watch them up close! Thanks Tom and also to Vermont Birder Blog! There's something about the landscape and small towns in northern New England that I've always found appealing. The air seemed to get fresher and mind clearer as I took a 4 hour drive to the area of Vermont that is referred to as the Northeast Kingdom. 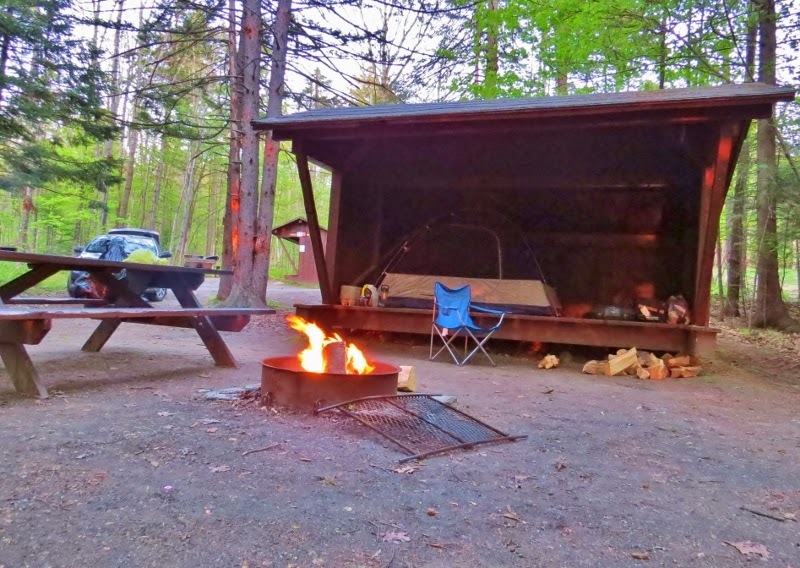 I stayed at a little campground in East Burke that was nearly empty during my stay as most of the camping there takes place after Memorial Day when the mountain biking season starts to get busier. I used a lean-to for the first time. I found it made for a convenient way to store gear and to protect a tent from rain. If it weren't for the bug factor I wouldn't have bothered with a tent. I did most of my birding at a tiny town called Victory that I had visited the previous Fall. Victory has a population of less than a hundred and wasn't even hooked up to the electric grid until 1963.It has a dirt road running through the town which has access to some great birding habitat including the kind of half-dying spruce stands that Black-backed Woodpeckers like. That is the main reason that I camped in that area. 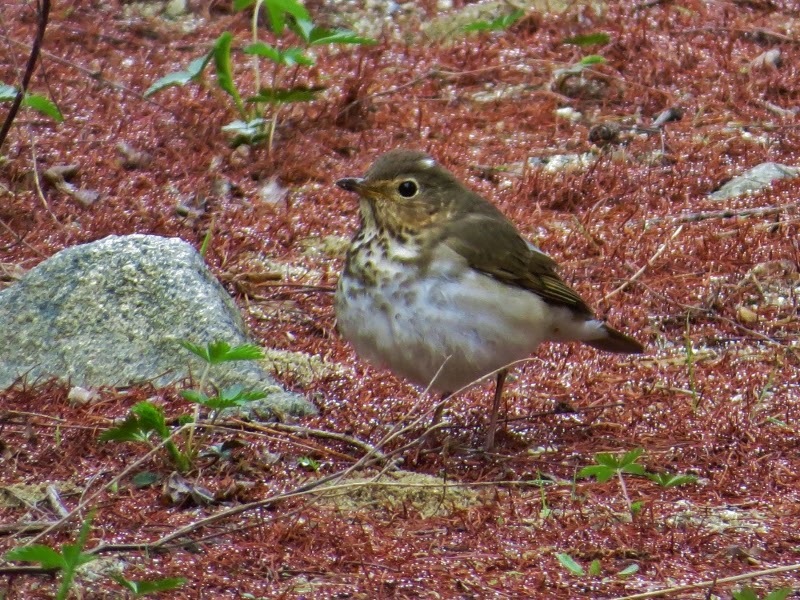 I saw a number of birds that are hard to find in Connecticut including the Swainson's Thrush seen in the photo above. They're tricky to identify but we had a pretty good view of it which helped. 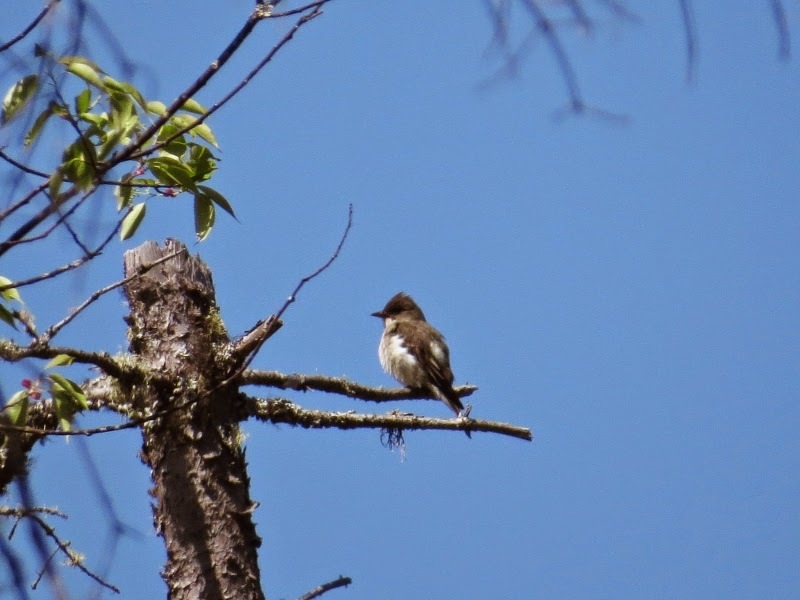 Olive-sided Flycatcher was another pleasant surprise for me. Their song is supposed to sound like quick-three-beers! The "quick" part of the song is subtle but the 3 beers portion was loud and piercing even from a distance. We also had 2 yellow-bellied Flycatchers on the same day. 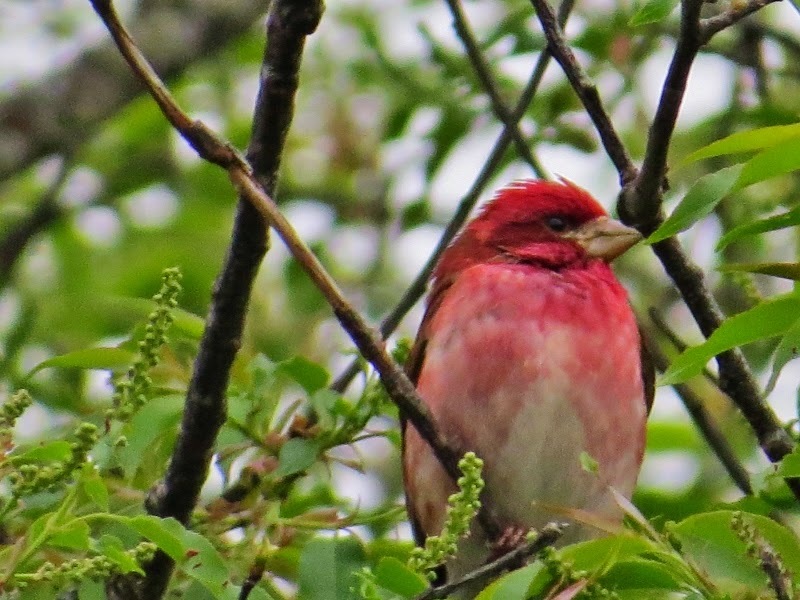 Purple Finches are plentiful up that way. Their raspberry color stands out even on cloudy days. 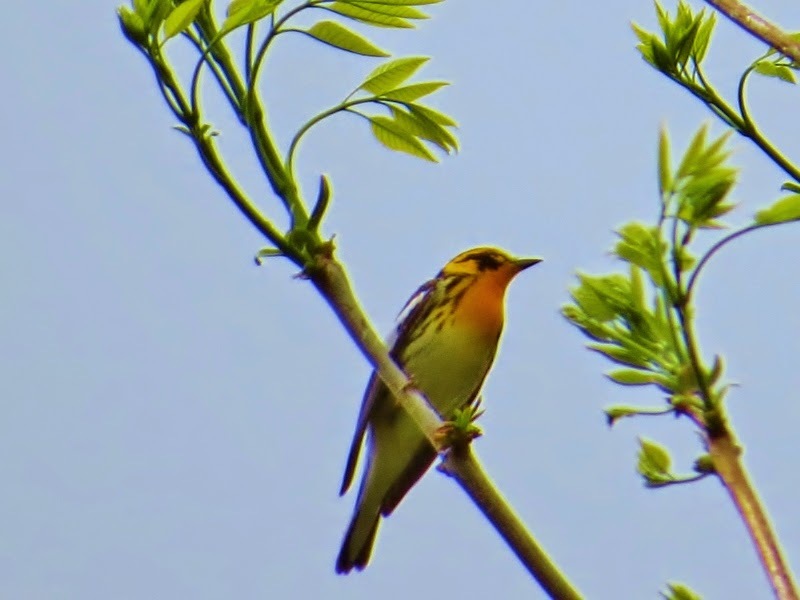 I saw 16 species of warblers including Blackburnian (above), Nashville, and Canada. Black-throated Blue, Chestnut-sided, and Magnolias were so numerous that I could hear them singing wherever I walked. My only regret is that I didn't take more pictures (or at least better pictures). I was so wrapped up in the birding action that I didn't want to put my binoculars down to grab my camera. It was one of those trips where I was in the right place at the right time. I hope to return to the same place next May. So did I find a Black-backed Woodpecker during my stay? I'll have an update on that in my next post. 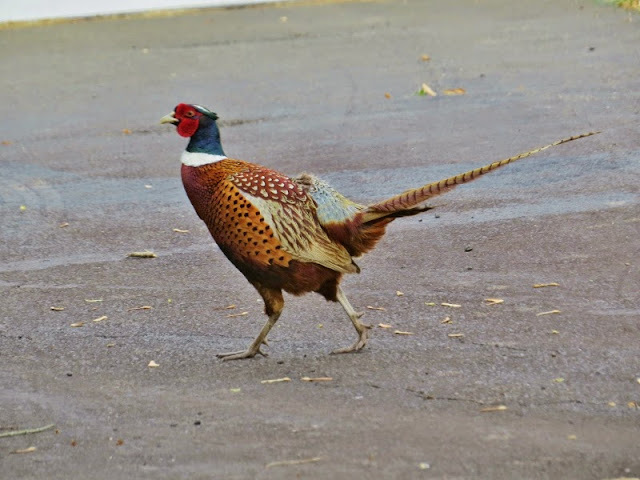 Why Did The Pheasant Cross The Road? Maybe he "chickened out" when I pointed my camera at him? If I had to pick one month as my favorite I would pick the month of May. Everywhere you look there are birds and plant life bursting with brilliant color. 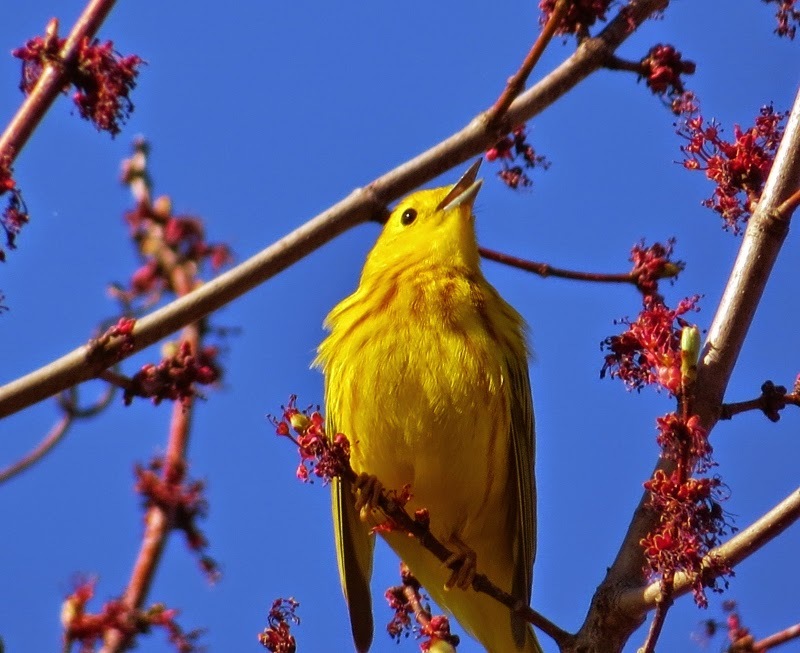 The weather is as perfect as it's going to get and birds are singing from every tree-top (Yellow Warbler). 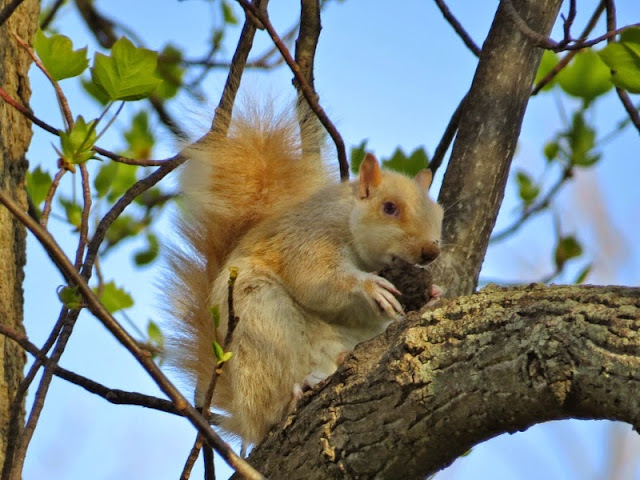 There are so many unexpected surprises waiting around every corner like this unusually whitish looking grey squirrel. There are so many birds to see in May but the month goes by so fast. 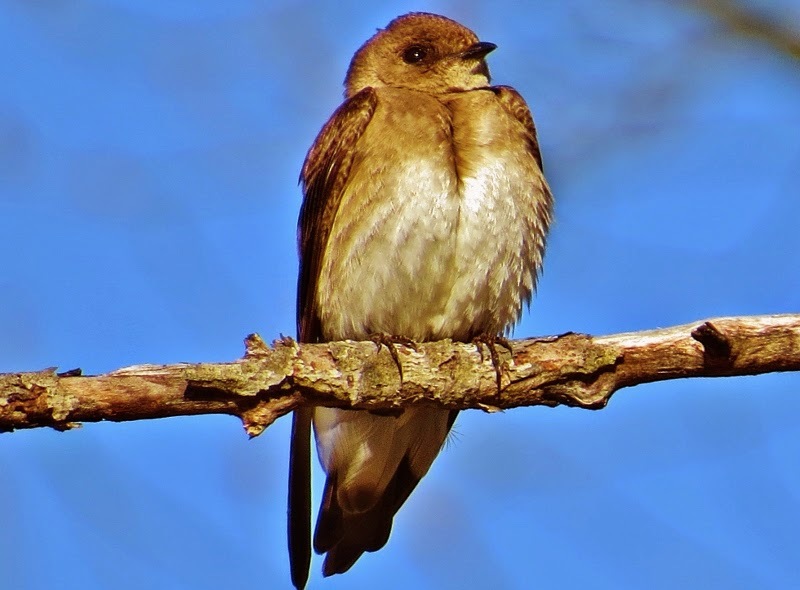 I wish the month lasted longer so I could take my time appreciating birds like Rough-winged Swallows and not be in a rush to try to catch every warbler. There's just so much to see and hear that it's impossible to take it all in. I'm hoping that time will slow down a little just for this month.